Once your short term food storage goals are met (or close to it), the next item of preparedness in the food category is to work on storing some long term food storage. These foods are items that will sustain life and store for a long time. 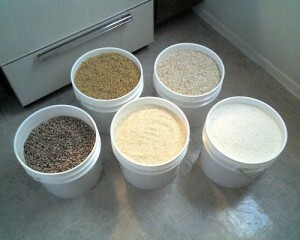 This is where your buckets of wheat and rice and beans come into play in your food storage plan. If packed properly, the long term storage items should store for 10-30 years or more, so we’re not talking about jars of peanut butter or cans of soup here. These are primarily your staples: grains, legumes, sugars, honey, powdered milk. Depending on what you eat regularly, some of the items in your short term storage will be the same as in your long term storage. A couple of ours are baking soda, yeast, and rice. I know the rice will store 30+ years, but we use it and rotate new rice in. You can continually rotate them into your short term supply, or you can stock some of the long term foods just for long term. I put those boxes where I won’t need to be getting to them frequently, like in the very corners of the food storage room where I can’t get without moving a bunch of other things. There has been the guideline that you should aim for a year’s supply of food and I believe this used to be what was taught by the LDS Church, but their newest food storage guidelines “encourage you to store as much as circumstances will allow.” Store as little or as much as your circumstances will allow. Does this mean storing more than a year’s supply? Sure, if you have the means to do it. If you don’t, just store what you can. Anything is better than nothing. Do make sure to package your long term food storage for long term storage if you intend to store it and not just use it. I like the #10 cans because they pack easily in boxes and I can lift them ;). I also have long term storage in buckets which is also a good choice. In one house, I packed quite a lot in the mylar bags because they could fit under the beds in the rolling storage bins where the cans couldn’t, but later had some rodent problems with the bags–they are not mouse proof! We kept some of the bags in metal barrels in our carport and they did fine as the barrel was rodent proof. So if you’re looking to use the mylar bags of food for long term storage, just be aware that the mice can chew through them and take some precautions to prevent the loss of your food. Get some oxygen absorbers (sold at many preparedness retailers as well as the LDS canneries) and use 1 per can or mylar pouch or 3-5 per bucket (approximately 1 per gallon of bucket volume). 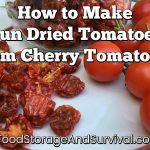 These go a long way toward keeping your stored foods fresh, and contrary to popular belief will not keep your grains or legumes from sprouting. Whole grains store longer than processed grains, so for longer storage get wheat berries instead of flour, oat groats instead of oatmeal, etc. Of course if you have no way to process your wheat or oats once they’re opened, you’ll want to store some flour and oatmeal as well. That about covers long term storage basics. If you’ve got some short term foods stored, look into getting some longer term storage started. You’ll be glad to have it when you need it, and if you never do, just think of it as insurance and if you do end up feeding some to the chickens or pigs, it’s okay. It’s like the homeowner’s or auto insurance policy that you pay on every month and hope to never have to actually use. Except this insurance may keep you alive some day. This is the first I’ve heard anyone mention legumes or grains sprouting. Is that a real problem with bucket storage? How do you avoid it? Kris, you want your wheat and legumes to be able to sprout. They won’t sprout by themselves unless they get wet, so won’t be sprouting in the buckets, only when you take it out and want to sprout some. Sorry for the confusion! We’ve found that 3 mylar bags fit nicely into a 5 gallon bucket. This has the added benefit of allow us to use only a portion of the contents at a time. Of course it critical that whatever storage mechanism you choose, be it a bucket or mylar bag, it must make an air tight seal. Is it ok to leave beans in the plastic bag they came in for storage or do we have to just dump them loose in the bag/bucket? You can leave them in the bag they are in if you want. You’ll get more volume in the bucket just dumping them in, and I wouldn’t plan on storing them past 3-5 years or so in their original packaging as that plastic might break down (I don’t know for sure) and then you’d have plastic bits in your bucket of beans. Those would be my thoughts on it. I do have some beans stored that are in their original bags, but they are just in a can with a plastic lid on it–not airtight. If I were sealing airtight with oxygen absorbers or something I’d just dump the beans out of their original bags into the bucket/can/mylar bag. For long term storage, you don’t have to remove the prepackaging in store-bought beans before storing in cans, buckets or bags. However, you still need to include the oxygen absorber, and make the can, bucket or bag airtight, because there is oxygen in the original packaging, and it will pass through the plastic over time into the bigger container. I bought a case of garbanzos (in 1-1/2 lb. bags), and just slipped each bag into a mylar bag with oxygen absorber. Saves time, has nutritional info, and is premeasured. This info came from LDS member. I would like to ask about storing rice and beans in glass jars with the rubber seal metal clasps.do i still need to put oxygen absorbers in jars? Chandra, it depends on how long you want to store them. I wouldn’t use the metal clasp style jars for storing anything too long term just because I haven’t seen any research on how air tight they are, so if you’re storing for use within 1-6 months you wouldn’t need the oxygen absorbers. If you want it in your storage any longer than about 6 months, oxygen absorbers will help preserve the freshness of the product assuming your jars will seal air tight. For Angela (24 May 2012). What I have done for storing in jars, is to use mason jars and a foodsaver jar sealer. This takes the air out. Pressing down on the cap should not produce a plinking sound. If so air is back in the jar. I dehydrated some eggs and they got verrrry crispy.When i grounded them up they are kinda light brownish in color,Should I still put them up in food storage(for just in case worse comes to worse and need them)or toss them,it’s about 31/2 dozen,don’t really want to throw them away if i don’t need to. Where can I buy empty #10 cans? Also, if I store beans etc. in #10 cans, do I need to put it in a mylar bag first? I get empty #10 cans at my local LDS dry pack cannery (home storage center). You will also need the can sealer or access to it, which you can get at the LDS cannery as well. They also have oxygen absorbers for purchase. Some of the cannery locations will rent their can sealer out to you so you can take it home and seal your cans. Locations of canneries in the US is here.